GAI and GAI Conferences and "AI: A Modern --Sorry-- Post-Mortem Approach"
Well, congratulations for the topics and for those guys reforming, but the term is ridiculous. It's obviously coined by orthodox scientifical AI-niks, who're reforming, while keeping their scientific roots (means citations, publications in "high-impact journals" etc.). I'd stick to the terms AGI and UAI, like in Bulgarian I prefer "УИР" (UIR - Universalen Izkustven Razum) which encompasses both, instead of "УИИ" (UII - "Intelekt"). One of the simple practical reasons is that "УИИ" (UII) sounds too close to "хуй" (HUY) ~ it means "D." English word starting with dic*. "The importance of Artificial Intelligence in Portugal is visible by the number of PhDs (over 100), the sheer number of researchers ..."
Good... I'm not saying this for the first time, like for example about the "MEXICA" "creative" framework. Sorry, but what the h* are all these PhDs doing? Hundreds, thousands, 10s of thousands researchers are supposed to be working on "GAI" projects full-time. Thousands of human-months work. Results? Real things? Real things and progress is actually coming from non-PhDs, such as formally electrical engineer and neuroscientist Jeff Hawkins, or mathematics and physics PhDs, such as M. Hutter, J.Schmidhuber and B. Goertzel. Very smart, funny and high-status guy, obviously, but I have never had patience to give his book a try, I just knew it's "classics", partially because long time ago I started to distinguish myself from "AI", insisting that if all that junk is called "AI", the least thing one could do is to coin a non-polluted term and stay away. Now I glanced the content of this "classics" and saw I've not mistaken not reading it... Sorry, but I didn't see anything "modern" in a 1000 pages of random high-level non-scaling really classical methods (except a few chapters on agents and machine learning). Dear respectful high status scientists and directors - give us results, please. Pretentious pedantically written PhD theses and a large number of publications or citations are meaningful status-symbol per se mostly in the pretentious environment of the scientific conferences and non-specialists surrounding where the only mean for the others to recognize how big researcher you are is to count your publications and citations or how high you are in the science status - PhD student, PhD, Post-Doc, .... Check the links above to understand what's wrong with that. 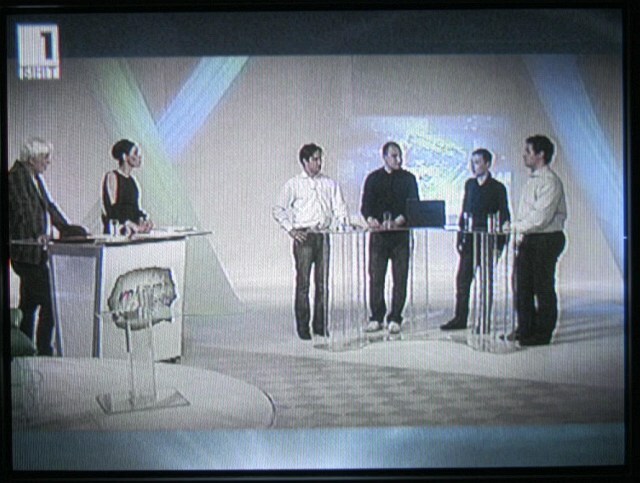 А live shot from the first sessiion on the set on Tuesday, a day before the recording of the first show. 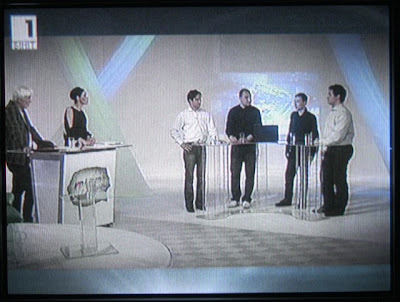 This moment was aired in the end of the prime time news on Bulgarian National Television. 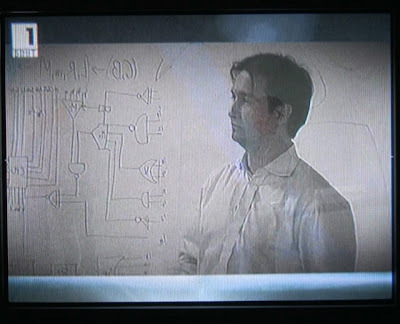 A shot from the show Rossen explains how Kevin Warwick connects biological neurons to an artificial cybernetic system. (Coordinate, Brightness) --> (Length of reccurence, compression Ratio, miss, Match) ... Terms from some of the basics in Boris' definition of cognitive algorithm. 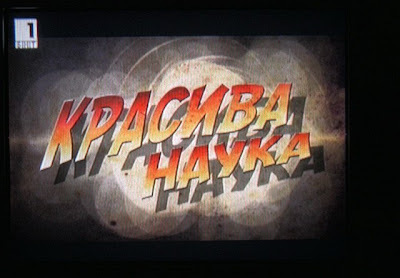 There were several spots within the show; one covering Bulgaria based Blue Gene (12 TFLOPS), which when first installed was in Top 100 of TOP500.org and have been the fastest machine between Munich and Moscow. There were a few about the FameLab Science Communication Comptetition, which is happening now for the 5-th year in Bulgaria and is the origin of this show and most of us, the participants who shape the discussions. If you understand Bulgarian, you can watch the show here, it was aired on Saturday, 16/4. Special guest was Kevin Warwick from The University of Reading, UK. Maybe he doesn't need an introduction, but let's say he calls himself "the first cyborg". Four young scientists, 3 of them with background in "FameLab". - Rossen Ugrinov, winner of the first "FameLab" contest in Bulgaria in 2007. He's a biophysicist and is being involved in monitoring clinical testing; his point was about the risks and precautions. - Nuri Ismail - he's part of the team developing one of the leading OCR software (free-onlince-ocr.com), he was presenting some narrow AI achievements - AI is here since many years, it's not as ambitious as in cinema, but there are many applications we're using. He was second in FameLab 2009. - Svetlin Penkov - very bright second year student of K. Warwick, studying Robotics in Reading. He talked about some small robo-sumo robots, neuron networks, about the risks regarding brain-implants and "super humans" vs "under-developed humans" with no implants. 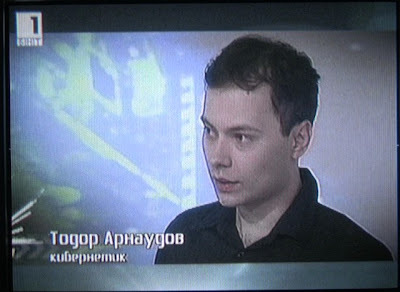 - Todor Arnaudov - I was supposed to talk about AGI, Universal AI. 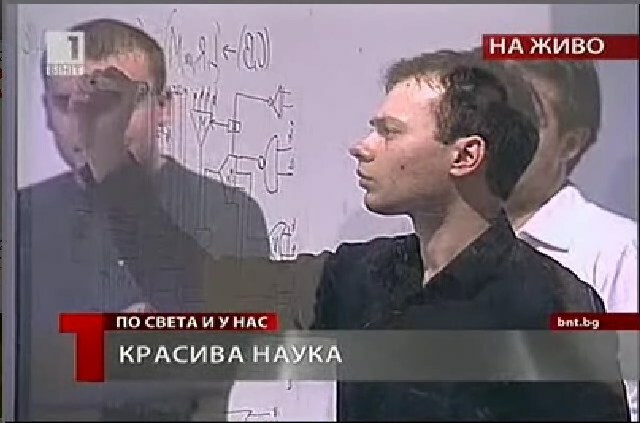 I joined the discussion in the end, with a short explanation of Seed AI and self-improving system as a remark to a note that current AI can't ask questions, which one of the other guests made - Lyuben Dilov Jr., a writer, publicist and son of the prominent Bulgarian SF writer. I explained this is what we aim - to achieve a system that learns like a baby: it's blind and deaf and lack motor coordination, then it begins to recognize of simple objects and sounds; then the face of its "mother", then other faces; then it "crows", say its first words, first basic sentences... And after this, it will start asking questions; reading etc.